I hope you got a chance to watch Elisha, from Rebel Grain, on Food Fighters last night! We have became pretty close blogger buddies over the last few months while we waited for Food Fighters to air. 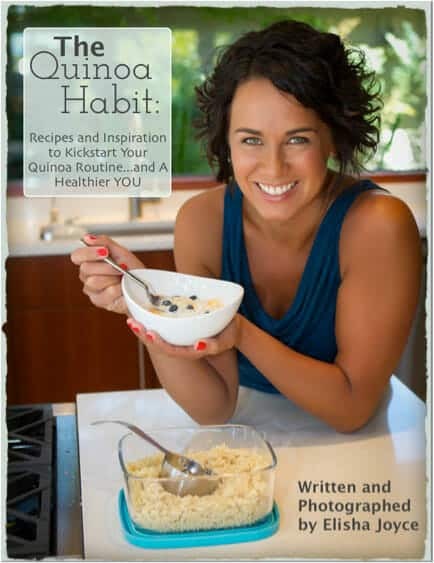 She sent me a copy of her new ecookbook, The Quinoa Habit, and I wanted to make something out of it and giveaway a few copies! This Kale Quinoa Salad salad caught my eye for a number of reasons, but mostly just because it featured a wonderful looking dressing and crunchy vegetables like corn and peas that are super seasonal right now. 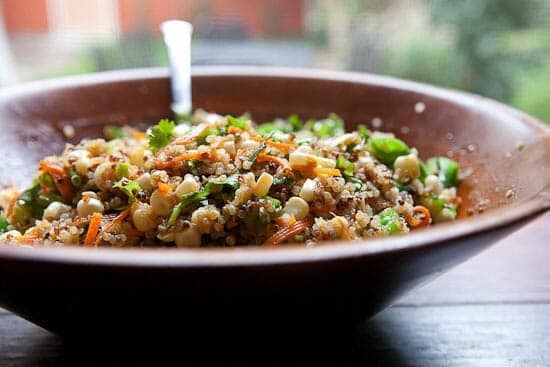 A simple and flavorful Asian quinoa salad from The Quinoa Habit. Perfect for a side dish or lunches! 1) Whisk together ingredients for dressing and set aside. 2) Cook quinoa according to instructions. Generally, this involves two cups of water per cup of uncooked quinoa. Bring water to a simmer and add quinoa. Turn heat down to medium-low and simmer, covered, for 18-20 minutes until water is absorbed. Remove from heat and let steam for 10 minutes. Fluff quinoa with a fork. 3) Meanwhile, prep all the veggies for the salad and toss them in a large bowl. 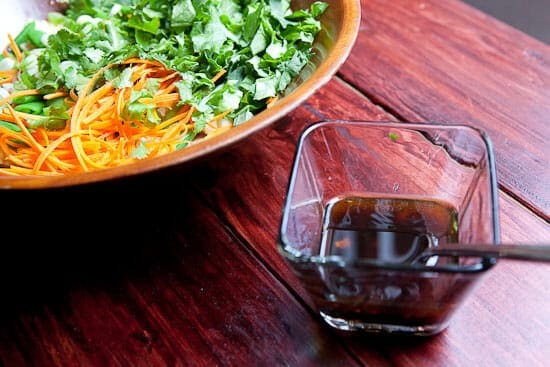 4) Pour dressing over veggies and stir to combine. Add quinoa very last and toss to combine. Serve warm or chill for later. Recipe from The Quinoa Habit. I like The Quinoa Habit because, well, I like quinoa, but also because it kind of uses the Love your Leftovers method of making a big batch of something (quinoa in this case) and then using it to supplement meals and recipes throughout the week. To make this Kale Quinoa Salad though, I just cooked up a batch of tri-color quinoa. There are some good tips on cooking quinoa in the book. Sometimes I add too much water to mine and it ends up being sticky rather than fluffy. This version turned out great though and was light and fluffy! 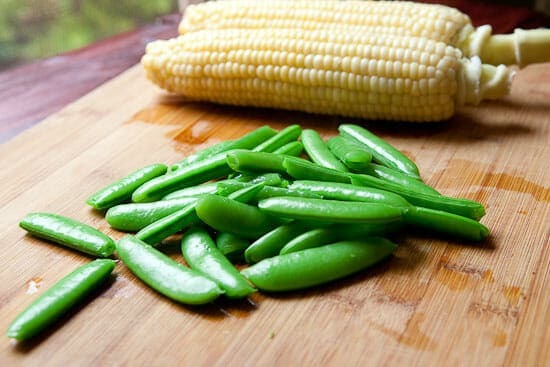 The original recipe called for frozen peas which are nice to use any time of the year, but since it’s summer now, I substituted a big handful of snap peas that I just snipped the ends off of and blanched for a minute in lightly salted, simmering water. Preparing your vegetables while the quinoa cooks is always a good idea. I blanched the corn quickly in boiling water also and then cut it off the cob. I chopped my peas in half, grated a carrot, and roughly diced the other ingredients! My favorite part about this Kale Quinoa Salad recipe is the dressing. It’s packed with sesame flavors and a little sweetness from some honey. It goes great with the crunchy vegetables. If you want to start conservatively, you could add half the dressing, but I wanted all of it, for sure. The best takeaway I learned from this recipe solved a problem I always have with quinoa salad which is quinoa clumping! By drizzling the vegetables with the dressing and tossing that together and then folding in the quinoa last, you get a really well-distributed salad with no big lumps of quinoa. Doing stuff in the right order really does help sometimes! I ate about half of this Kale Quinoa Salad right away with a big old spoon, but the rest of it saved perfectly for the next few days and I snacked on it for lunch. Really delicious, colorful, fresh, and fast! Elisha was nice enough to offer to giveaway a few copies of the book. The ebook is available in the ibookstore or you can also snag an easy-to-read PDF copy. If you want to be entered to win a free copy, just leave a comment with your favorite quinoa recipe! I’ll pick two winners on Monday, August 4th! Making grains on Sunday is one of my favorite ways to ensure I’ll have a tasty, healthy lunch for the week! My current favorite is a tabbouleh quinoa salad with tomatoes and cucumber and feta, topped with an apple cider vinaigrette and lots of fresh herbs. I make a riff on a quinoa salad I found on Pinterest…it’s quinoa with a lot of lemon juice, a little kosher salt, cucumber, and avocado. It’s one of my favorite lunches! I use quinoa in place of small pasta in a simple salad of veggies and a light vinaigrette dressing. So far the family seems to ask for the “other” pasta salad more often that the original. I’m a huge fan of breakfast quinoa with dried apricots, almonds, maple syrup, and spices. Drizzle a little bit of yogurt over top and it’s a super satisfying way to start the day. I also love to add it to salad, chili, and more. I’ve been making a quinoa fruit salad with a honey-lime-mint dressing- it’s great for summer! I have been obsessed with creating my own versions of quinoa for breakfast, and it all started with this recipe received from the company I buy all my juices from (Pressed Juicery is the bomb). I am new to the quinoa scene and have only made it a couple of times so far. 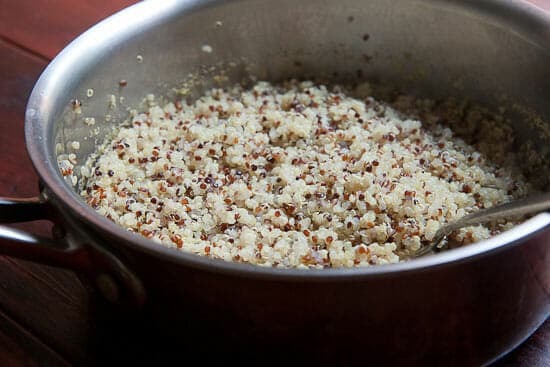 This article was very helpful in that I definitely added too much water and will try adding the quinoa after the dressing in the recipe I made. I look forward to making this recipe, it looks delicious! The recipe that made me HAVE to try quinoa is Tequila-Lime Shrimp and Quinoa Salad posted by Iowa Girl Eats. Outstanding!! Looks great, although I prefer grains with a bit more chew: wheat berries, etc. Will definitely try the recipe. Great photos and instructions! I have been slow to ride the quinoa train but now I am out of the train station and riding. I would love to have more recipes. Thanks for this post. I am going to try it. Quinoa is so versatile! I have made this salad for lunch and then had leftovers for several days as a side dish. 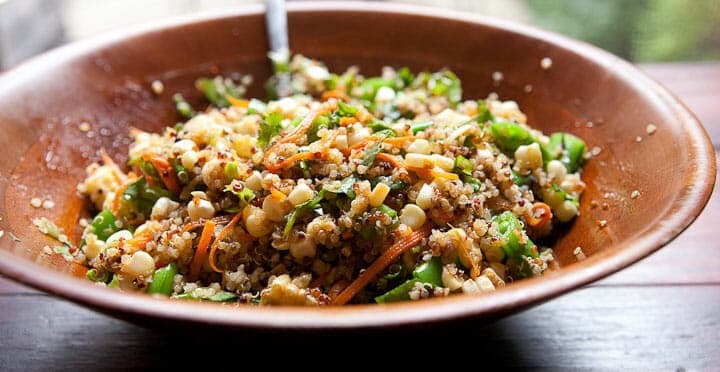 To one cup cooked quinoa add a can of rinsed black beans, a can of drained mexi-style sweet corn (or plain sweet corn and a diced red bell pepper), and 1/4 cup chopped cilantro. Mix 3T lime juice, 2T olive oil, 2t ground cumin. Mix it all up and add salt & pepper to taste. If you’re like Nick – you can add a finely chopped chipotle pepper in adobo sauce. I loved watching her last night on Food Fight. I love her style. I have never made quinoa before. I am interested in this book because I would like to expand my knowledge in the kitchen. Quinoa intimidates me but after reading about this recipe I think I am headed to the store to get some of this tasty grain. Well, I probably need this book because so far my most daring recipe is cooking quinoa in water. I like to then mix the cooked stuff with vegetables and beans and such and eat hot or cold; though surely there must be more to it than that! I prefer my tri-color quinoa with small chopped crunchy veggies and just some olive oil, lemon and garlic. My son prefers it for breakfast half and half oatmeal an quinoa with agave and blueberries and chia seeds. I love quinoa chili in the winter and quinoa patties or burgers all year round. So filling and delicious! I use quinoa a lot in turkey and quinoa meatloaf. It makes the most delicious meatloaf (or turkey meat-like product….as my brother puts it. he won’t accept it being called meatloaf :)). I think this recipe looks delicious and I can’t wait to try it. 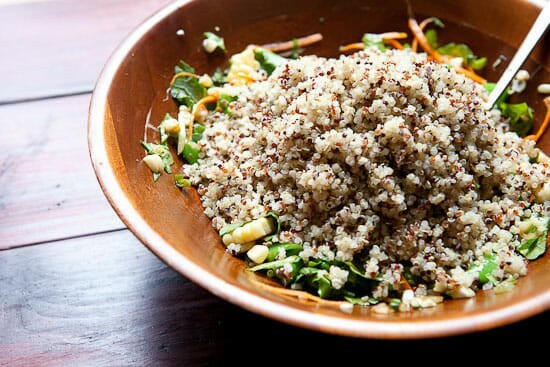 I love quinoa and substitute it for many recipes that call for bulger, couscous or rice. Make sure ya rinse the quinoa first before cooking in a fine mesh strainer as rinsing will cut down on the bitter taste. My husband and I did watch the show last nite, and Elisha did a great job! It seems like the tasters liked dishes that were somewhat familiar to them in taste w/ a little flair or pop– not too spicey, either. It was interesting to see the egos of the master chefs and how they responded to losing or winning. Good luck Nick when your episode airs! Could you mention the date again? I always like a nice, bright quinoa dish, usually with some lemon, garlic, maybe some cilantro or basil depending. I like to add quinoa to my regular cold breakfast of steel cut oats (only cooked for about one minute and then refrigerated), chia seeds, coconut milk, and frozen blueberries. I cooked up a big batch in some flavored broth. The portion it out in containers. Heat up at work then toss with a protein and a bowl of fresh veggies. It’s like having a hot filling meal but the veggies keep it light for summer. So I’ve tried quinoa at least three times, and every time it’s been an utter failure. Not sure if it’s because i’ve cooked it wrong or I just don’t like the flavor. Most likely the former. Any tips?? This looks awesome though so I’m going to give it a go again. Congrats on the show BTW. Can’t wait to tune in. I’m a huge fan of making granola with oats and quinoa, or just quinoa. It’ toasts up so nice and crunchy. This sounds delicious! I’ve been wanting to incorporate more quinoa and kale into our diet and this recipe looks to be a great start. Would love to win the book! Loved the show last night. Looking forward to more shows. Thanks for alerting us to it. That lady could really cook! I was awed by her abilities in cooking. Such fun to watch. Thanks. I have only ever had plain quinoa as a side but I am wanting to try a recipe for quinoa macaroni & cheese! It sounds delicious! 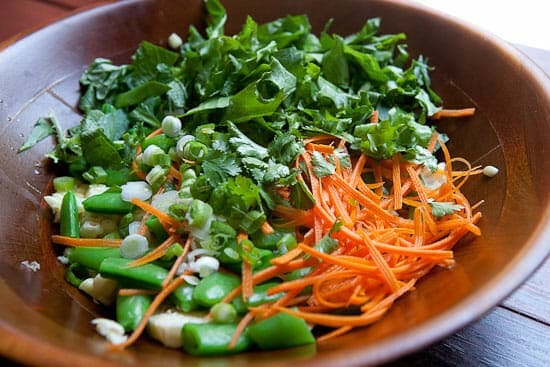 A perfect summer salad. I love the idea of adding vegetables straight from the garden, and having a cool, balanced meal ready to eat at the end of a hot summer day. Perfect for picnics. If I could look like Elisha, I’d eat a big bowl of this every day! I don’t have one yet! I have been wanting to experiment with quinoa. This book would help! I love making a Mexican “fiesta” quinoa with black beans corn tomatoes poblanos and a cheesy pepper jack sauce ! Watched her episode of Food Fighters last night (gotta love the DVR) and thought she maid some interesting sauces so I am sure the dressing is tasty. This recipe sounds like it would be a good side for our pot-sticker nights! A summer staple in our house is quinoa, chickpeas, lots (and lots) of colorful crunchy veggies topped with Macheesemo House Dressing. I use quinoa in place of grits when making shrimp and grits. It’s a healthy version and just as good. My favorite quinoa recipe is a tomato corn cilantro and quinoa salad my husband regularly makes for family pot-lucks. Its quick to make, healthy and tastes great! We are always on the look- out for good quinoa recipes. Oh YUM!!!!! I can not wait to try this one, as it looks too Good and Healthy. I Love Asian foods, anything Asian, I will try!!!! A friend recently introduced me to your blog and I have been thoroughly enjoying trying the recipes you post. I also, recently, re-discovered my fondness for quinoa so I’m really looking forward to trying this and researching more recipes for this as a base. Thanks for being an inspiration and helping me to start loving cooking again. Sounds wonderful. Just bought my first quinoa and this looks like a good way to use it. Can’t wait to try it. My favorite lately is to cook the quinoa store in fridge. In the morning I take out a bowl full and add chopped strawberries, mango if I have, some blue berries, what ever I have and drizzle on some agave or honey and I have a really great breakfast that suits me just fine durring this HOT Florida summer!! I love making quinoa mac n’ cheese. I cook the quinoa, mix it with some cheese and milk, add in some green onions and tomatoes, then bake it in the oven. It makes a great lunch to bring to work! One of the favorite ways to have quinoa is recipe by America’s Test Kitchen called Quinoa and Vegetable Stew. Thanks for the giveaway. I’ve only ever made one quinoa recipe, but it was really good – a cold quinoa salad with black beans, peppers, and a lime dressing. Yum! I like adding spice to quinoa. I made one with an Indian curry with sauteed garlic and onions added to it. Love your photos showing us how to make your awesome dish! I don’t cook quinoa near enough, but I’m going to give your recipe a try! I discovered quinoa late in life. Now to add it to the bacon chorale, haha!!! My kids now love quinoa and brown sugar for breakfast. It took a little time to condition them, now it’s a staple. Great energy for the day! Yum! I’m making this tonight. MY EVERYDAY BASIC RECIPE FOR QUINOA IS TO REPLACE 1 OF THE 2 CUPS OF WATER WITH ORGANIC VEGETABLE STOCK AND ADD SCALLIONS/GREEN ONIONS. I COOK A FRESH POT OF THIS EACH WEEK AND AS SOON AS IT FINISHED I COOK A FRESH SUPPLY. I EAT QUINOA PRACTICALLY EACH DAY AND I JUST LOVE IT!!! I HAVE ADDED MUSHROOMS, BROCCOLI AND ETC. THANKS FOR THE GIVEAWAY!!! Quinoa has become a comfort food for me. I also made my husband love it…who is a meat and rice guy…of all people. I must try this recipe! I saw Elisha make a wonderfully simple spinach salad with quinoa, avacado, tomatoes and a simple EVOO and lemon juice dressing on a morning news show for Portland. It’s become a signature staple around here. Delizioso! I have to admit I have never had quinoa – didn’t think I would like it but after seeing Elisha win Food Fighters and beat the Taco Bell sell out (woo Hoo) AND she is a fellow Guamanian (!) I have been wanting to try quinoa. This recipe is the one I’m going to try first! The Vegies AND the dressing sound perfect!! This recipe is just my style – using up what’s in the fridge. The dressing looks great!!! My favorite way is to make it as I would make oatmeal – cook it in milk and then add berries, honey and almonds on top for breakfast. Delicious!